*Adapted from the Back to School 2018 edition of HealthyChildren.org‘s e-magazine. Maintaining a healthy diet is an important aspect to include in everyone's daily routine. For children, this may be a challenge. School, extracurricular activities, and lack of time can often interfere with healthy eating habits. Since kids spend nearly 40 hours a week at school, it's no surprise that school is a powerful influencer in their lives. Since kids may find themselves eating breakfast, lunch, and snacks at school, this can serve as a big opportunity for children to expand their eating preferences. This excerpt, adapted from The Picky Eater Project: 6 Weeks to Happier, Healthier Family Mealtimes by Natalie Digate Muth, MD, MPH, RDN, FAAP, and Sally Sampson, Founder, ChopChop Kids, provides healthy eating tips, as well as easy-to-create lunch plans and snack ideas sure to please the busiest (or pickiest!) child. The best way to ensure your kids will actually eat the food you put in their lunch box is to give them some control of what goes in there. Even the pickiest eaters enjoy some healthy foods. Be sure to include at least one healthy item your child loves. And next time you head out to the grocery store, ask for your kids' input into what healthy food they'd like to have in their lunch boxes. The mere exercise of helping them sort through their favorites will help them learn what types of foods are healthy for their bodies and which ones are less healthy. Try to include something from each of the major food groups--a whole grain; a protein-containing food, such as meat, beans, or legumes; a fruit; a vegetable; and a dairy product or another calcium-containing food--in your child's lunch box every day. Even if she chooses not to eat it all, your child will start to pick up on what a balanced meal includes. Increase exposure to healthy foods. Use lunchtime as an opportunity to expose your children to a small amount of a previously rejected food. Even if they choose not to eat, mere exposure may help increase the chances they'll appreciate it in the future. It often takes 15 to 20 tries for a child to accept a previously rejected food. Preparing lunch gives you a perfect opportunity to pay attention to portion control. Use plastic bags, attempt to measure out standard portions, and include some inherently portion-controlled items for the lunch box, such as an apple or string cheese. Have a particularly challenging picky eater? 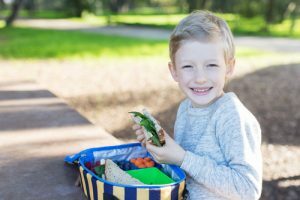 Helping Your Child with Extreme Picky Eating: A Step-by-Step Guide for Overcoming Selective Eating, Food Aversion, and Feeding Disorders by Katja Rowell et al.